The Training Room in the Nintendo 3DS remake. 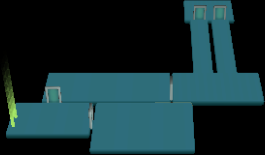 The Training Room is a location in Luigi's Mansion. It is one of the places Luigi can go from The Lab, along with the Mansion, the Gallery, and the Hidden Mansion. In this room, Professor E. Gadd sends Gold Ghosts in for Luigi to fight, starting with one and ending with ten. E. Gadd congratulates the player depending on how many ghosts they have captured. If the player captures seven or more, fireworks explode and Professor E. Gadd happily congratulates Luigi. The Nintendo 3DS version features a slightly different Training Room and Gold Ghosts pop out of the warp pipes in an orb-like shape, similar to the Gold Ghost carrying a key in the Foyer. There is a door to the left of the Training Room. While it cannot be entered, it leads to The Lab, according to the Game Boy Horror. This page was last edited on October 12, 2018, at 20:45.